As one of the top attractions in the UK, Thorpe Park is synonymous with fun and thrilling days out for families. 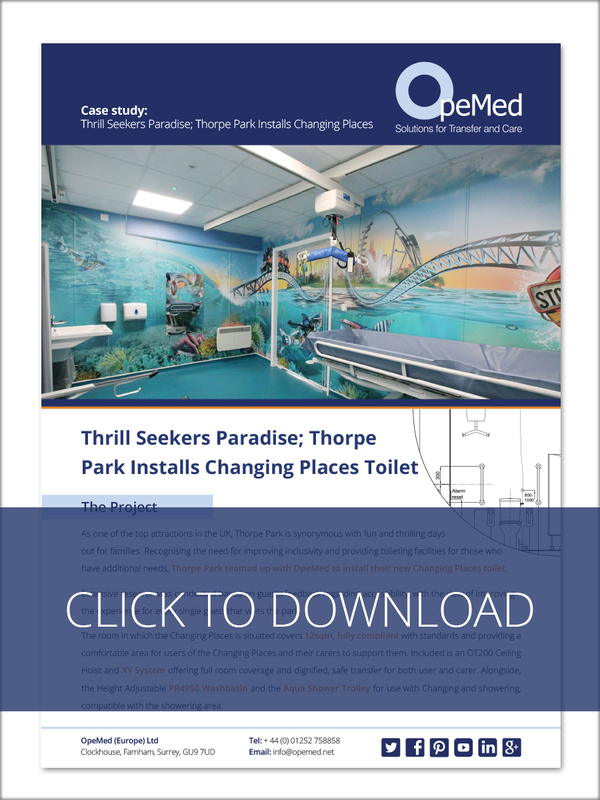 Recognising the need for improving inclusivity and providing toileting facilities for those who have additional needs, Thorpe Park teamed up with OpeMed to install their new Changing Places toilet. The room in which the Changing Places is situated covers 12sqm, fully compliant with standards and providing a comfortable area for users of the Changing Places and their carers to support them. Included is an OT200 Ceiling Hoist and XY System offering full room coverage and dignified, safe transfer for both user and carer. Alongside, the Height Adjustable PR4950 Washbasin and the Aqua Shower Trolley for use with Changing and showering, compatible with the showering area. Are you interested in installing a Changing Places in your facility? Please click here to contact us. To learn more about the Changing Places requirements and specifications, please click here.